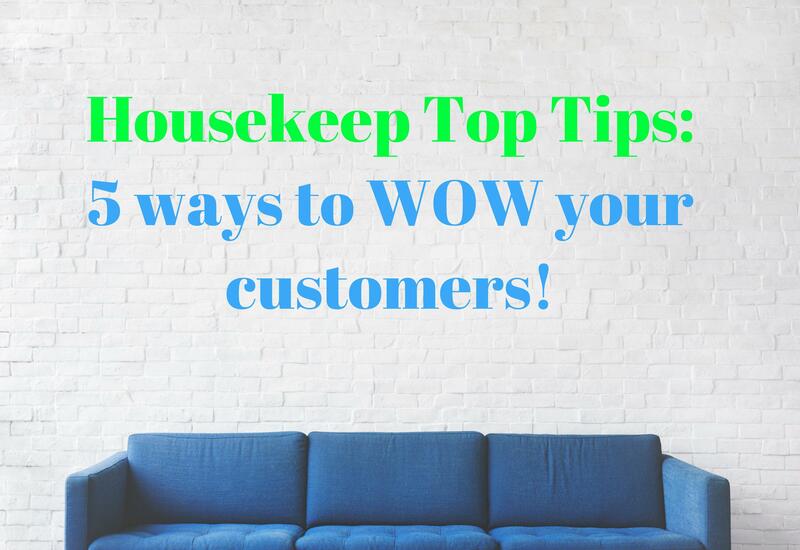 At Housekeep we very much welcome all the feedback we receive, using this to improve all aspects of our service; from the customer support in the office to the wonderful cleans that Housekeepers provide, we’re always looking for ways to make the experience all the more special. This week we’ve picked out the 5 aspects that customers have told us they care about most during cleans - these are things that, for them, make the experience that much better. We have picked these 5 top tips that take a general clean and turn it into the fantastic experience we strive for. A smile is the universal sign of happiness and conveys warmth and friendliness, so it’s no surprise that this our no. 1 tip. No one wants to invite someone into their home for the first time who is preoccupied with their phone, or too rushed to introduce themselves. A big smile and an introduction really gets the whole experience off to a good start. In fact, some research in the retail sector has found that people are willing to spend 40% more if they are served with a smile - if that’s true then this could be one of the easiest ways to boost tips! This comes up a lot and it makes total sense. For instance, you wouldn’t go to a restaurant to have food that you could cook at home for less - you spend that bit extra for something super special! So what are the things that add that extra sparkle to a clean and make it feel extra special? Sparklings taps, mirrors and shower glass are definitely on the list of what constitutes a fantastic clean. Getting into those corners and areas that people generally try to avoid in everyday life also adds to the 5-star experience (think skirting boards, plug holes, behind doors and the bin). Finally, but importantly; using any extra time left over to go the extra mile and do things outside of the general clean is a sure-fire way to wow your customers! Cleaning someone’s home has a wonderfully personal touch: the task at hand involves caring for someone’s belongings and making their home beautifully inviting for their return. Of course, letting someone you haven’t yet met into your home can, understandably, cause a little trepidation at first. Invariably, though, this turns into delight when the little things are looked after. Things like ensuring all the lights are turned off before leaving, checking the windows are closed in the winter, taking the washing out of the machine to dry, putting the dishwasher on and putting the post on the table, These little touches show care has been taken and their home is being well looked after. It’s always important to make sure that any items you’ve moved to clean beneath are returned to their homes, too! Unsurprisingly, everyone is different - and so are their homes -so each clean is going to be unique. There really is no “one-size-fits-all” when it comes to cleaning, so it’s important we consider the individual needs of each customer. There are the general tasks like the bathroom and kitchen that almost always need doing, but people often have specific tasks they would like done (or not done! ).The tech team here at Housekeep added an instruction section specifically to esnure that those tasks could be conveyed to the Housekeeper at all times. In fact, our tech team have recently added a wonderful new feature that highlights any changes made to customer instructions to ensure that these tasks are never missed! Look out for the little flag and highlighted instructions to see what’s changed! Communication is an important part of any relationship, not least the working relationship of customers and their Housekeepers. Whether this be a lovely message left behind after the clean, a reminder that some products are running low, or a call when running a little late - communication is most definitely welcome! This isn’t just about customers getting to know their Housekeepers; effectively communicating before, during or after a clean helps everything run smoothly from start to finish and helps create that seamless and effortless experience that customers are looking for. It turns out, then, that it’s actually quite simple things that make the difference between a 4-star and a 5-star experience for customers. Although little details, following each of these tips will show your customers you really care. Having said that, it’s also the personal touch of each wonderful Housekeeper that makes the service personal, and we love that everyone has their own unique ways to make the experience special. For us here at the office, we love seeing wonderful reviews about great cleans or hearing stories from Housekeepers about their wonderful relationships with their customers. This reminds us why we do what we do, and never fails to brighten up our day! Keep up the great work, everyone - you really are London’s best home cleaners!